Truly outstanding duplex penthouse in the luxurious Torre Bermeja development. Upon entering this property you find the custom made fitted kitchen and laundry room, both designed by Clive Christian. From the kitchen bar you look onto the living and dining area. The dining area has a beautiful terrace facing west for al fresco dining while enjoying the sunset. The living area leads to another terrace offering spectacular views over the landscaped gardens, the protected Torre Bermeja tower and its surroundings to the Mediterranean Sea. There are two ample bedrooms with their own bathrooms on this floor. A comfortable staircase leads up to the private master suite, with large dressing area and bathroom. Before entering the master suite there is a door to the solarium terrace with a barbecue area, lounge bed and jacuzzi, all with breathtaking views. The property comes with B&O sound system throughout, including on the terraces, underfloor heating, air conditioning and two spacious car parking spaces and storage rooms in the underground car park. The complex has 24 hour security, an indoor pool and sauna with gymnasium for private use of the residents. Two large outdoor swimming pools are found in the impeccably maintained communal areas. 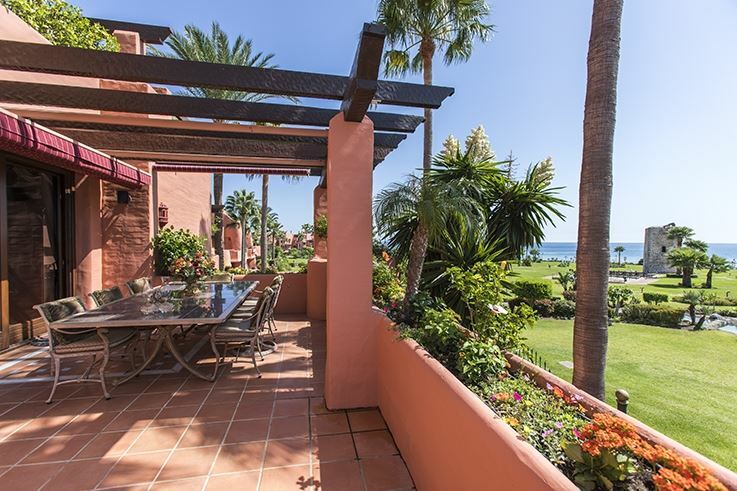 This is, without doubt, the very best penthouse in Torre Bermeja.